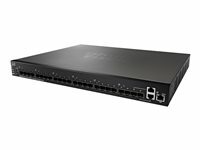 The Cisco SG500X-24P is a 24-port stackable managed Gigabit Ethernet switch, with 4 Enhanced Small Form-Factor Pluggable (SFP+) slots and optional 10 Gigabit Ethernet connectivity, that provides a solid foundation for your current business applications, as well as those you are planning for the future. It offers Power over Ethernet Plus, true stacking, advanced security, quality of service, energy-saving technology (EEE), IPv6, and network features that deliver the reliability and performance needed by demanding environments. The switch is easy to configure and manage with a choice of management tools. The Cisco SG500X-24P provides the ideal technology foundation at a price you can afford, and in a solution designed to grow with your business. Cisco® 500 Series Switches offer true stacking, high reliability, and performance at a price you can afford. These stackable managed switches, built for demanding environments, deliver a powerful networking foundation for today and tomorrow. Advanced Features: Strong security, advanced QoS, IPv6 support, Layer 3 routing, Gigabit Ethernet connectivity deliver the capabilities needed to support applications today and tomorrow. Simplified Network Setup and Operations: Intuitive browser-based tools, auto-configuration and discovery, and true stacking make theses switches easy to use and manage and simplify day-to-day network operations. The Cisco FindIT utility, which works through a simple toolbar on the user’s web browser, discovers Cisco devices in the network and displays basic information, such as serial numbers and IP addresses, to aid in configuration and deployment. (For more information, and to download this free utility, please visit www.cisco.com/go/findit. 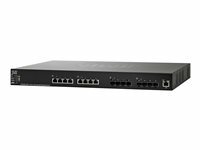 The Cisco SG500X-24P Switches is equipped with 24 PoE+ ports with a budget of 375W. This capability simplifies advanced technology deployments such as IP telephony, wireless, and IP surveillance by allowing you to connect and power network endpoints over a single Ethernet cable. With no need to install separate power supplies for IP phones or wireless access points, you can take advantage of advanced communications technologies more quickly, and at a lower cost. The Cisco SG500X-24P supports IEEE 802.3at PoE+. The power is managed in a smart fashion such that only the amount of power the endpoint needs is delivered to it and not wasted. As a result, the switches can support devices that require more power, such as dual-band 802.11n wireless access points, video-based IP phones, surveillance cameras, and more. Guest VLANs let you provide Internet connectivity to non-employee users while isolating critical business services from guest traffic. Support for advanced network security applications such as IEEE 802.1X port security tightly limits access to specific segments of your network. Web based authentication provides a consistent interface to authenticate all types of host devices and operating systems, without the complexity of deploying IEEE 802.1X clients on each endpoint. IPv6 First Hop Security extends the advanced threat protection to IPv6. This comprehensive security suite includes ND inspection, RA guard, DHCPv6 guard and neighbor binding integrity check, providing unparalleled protection against a vast range of address spoofing and man in the middle attack on IPv6networks. Time based ACLs and Port Operation restrict access to the network during predesignated times, such as business hours. DoS (denial-of-service) attack prevention maximizes network uptime in the presence of an attack. High-performance 10 gigabit Ethernet Cisco 550XG models in 550X Series switches break the barrier of 10 Gigabit Ethernet adoption by providing affordable and flexible configurations customized for the demanding network requirements of small and medium businesses. High reliability and resiliency In a growing business in which availability 24 hours a day, 7 days a week is critical, you need to assure that employees and customers can always access the data and resources whenever they need. In these environments, stackable switches can play an important role in eliminating downtime and improving network resiliency. For example, if a switch within a Cisco 550X Series stack fails, another switch immediately takes over, keeping your network up and running. You can also replace individual devices in the stack without taking your network offline or affecting employee productivity. Power efficiency The Cisco 550X Series integrates a variety of power-saving features across all models, providing the industry's most extensive energy-efficient switching portfolio. These switches are designed to conserve energy by optimizing power use, which helps protects the environment and reduce your energy costs. They provide an eco-friendly network solution without compromising performance. Easy deployment and use Cisco 550X Series switches are designed to be easy to use and manage by small and medium businesses, commercial customers, or the partners that serve them. Simplified IT operation Cisco 550X Series switches help optimize your IT operations with built-in features that simplify day-to-day network operation. Strong security Cisco 550X Series switches provide the advanced security features you need to protect your business data and keep unauthorized users off the network. Advanced layer 3 traffic management The Cisco 550X Series enables a more advanced set of traffic management capabilities to help growing businesses organize their networks more effectively and efficiently. For example, the switches provide static LAN Layer 3 routing, allowing you to segment your network into workgroups and communicate across VLANs without degrading application performance. IPv6 support As the IP address scheme evolves to accommodate a growing number of network devices, the Cisco 550X Series can support the transition to the next generation of networking and operating systems. These switches continue to support previous-generation IPv4, allowing you to evolve to the IPv6 standard at your own pace and helping ensure that your current network will continue to support your business applications in the future. Cisco 550X Series switches have successfully completed rigorous IPv6 testing and have received the USGv6 and IPv6 Gold certification. Networkwide automatic voice deployment Using a combination of Cisco Discovery Protocol, LLDP-MED, Auto Smart ports, and Voice Services Discovery Protocol (VSDP, a unique Cisco protocol), customers can deploy an end-to-end voice network dynamically. The switches in the network automatically converge around a single voice VLAN and QoS parameters and then propagate them out to the phones on the ports where they are discovered. For example, automated voice VLAN capabilities let you plug any IP phone (including third-party phones) into your IP telephony network and receive an immediate dial tone. The switch automatically configures the device with the right VLAN and QoS parameters to prioritize voice traffic. High reliability and resiliency Keep your network up and running with advanced redundancy and availability features that reduce downtime and improve network resiliency so your business never slows down. Advanced features Strong security, advanced QoS, IPv6 support, Layer 3 routing, Power over Ethernet Plus (PoE+) and 10 Gigabit Ethernet connectivity deliver the capabilities needed to support applications today and tomorrow. Power-efficient A variety of power-saving features, including Energy Efficient Ethernet, optimizes power usage and reduces energy consumption without compromising performance. Simplified network setup and operations Intuitive browser-based tools, auto-configuration and discovery, and true stacking make theses switches easy to use and manage and simplify day-to-day network operations. High-performance 10 Gigabit Ethernet Cisco 550XG models in 550X series switches break the barrier of 10 Gigabit Ethernet adoption by providing affordable and flexible configurations customized for the demanding network requirements of small and medium businesses. With 10G copper ports on those switches, you can easily and cost-effectively enable 10G connections to servers and network storage devices with standard RJ45 Ethernet cable. You can also connect the 10G SFP+ fiber ports to 10G uplinks of your access switches, building a high-performance aggregation or core to speed up the overall operation of your network. High reliability and resiliency In a growing business in which availability 24 hours a day, 7 days a week is critical, you need to assure that employees and customers can always access the data and resources whenever they need. In these environments, stackable switches can play an important role in eliminating downtime and improving network resiliency. For example, if a switch within a Cisco 550X series stack fails, another switch immediately takes over, keeping your network up and running. You can also replace individual devices in the stack without taking your network offline or affecting employee productivity. The Cisco 550X series is designed to deliver hardware redundancy at the lowest incremental cost. Power redundancy is delivered with the Cisco RPS2300 external RPS system. If power to the switch is lost (through loss of AC power or power supply failure), the switch will automatically, and instantaneously, obtain its power from the RPS. This switchover occurs so quickly that there is no loss in traffic or reboot of the device. A Cisco RPS2300 system can be connected to up to six 550X series switches to provide redundancy. Cooling fan redundancy is delivered through preinstalled N+1 configuration. A switch can fully support all its capabilities for the life of the product with only N fans. If one of the fans fails, the spare fan automatically takes over, without causing any downtime. The Cisco 550X series provides an additional layer of resiliency with support for the Virtual Router Redundancy Protocol (VRRP). VRRP lets you extend the same resiliency that stacking provides for individual switches to complete network domains. By running VRRP between two stacks, you can instantly cut over from one stack to another in the event of a problem and continue operating even after a failure. Advanced stacking Some switches claim to support stacking but in practice support only "clustering, " meaning that each switch must still be managed and configured individually. A true stack delivers a unified data and control plane, in addition to management plane, providing flexibility, scalability, and ease of use because the stack of units operates as a single entity constituting all the ports of the stack members. This capability can radically reduce complexity in a growing network environment while improving the resiliency and availability of network applications. True stacking also provides other cost savings and administrative benefits through features such as cross-stack QoS, VLANs, LAGs, and port mirroring, which clustered switches cannot support. Using standard 10G fiber or copper connections, the Cisco 550X series supports both local and horizontal stacking deployments and the flexibility of ring or chain topology. The switches also have the capability to use link aggregation port as the stacking port, providing even higher stacking bandwidth for demanding applications. Advanced Layer 3 traffic management The Cisco 550X series enables a more advanced set of traffic management capabilities to help growing businesses organize their networks more effectively and efficiently. For example, the switches provide static LAN Layer 3 routing, allowing you to segment your network into workgroups and communicate across VLANs without degrading application performance. With these capabilities, you can boost the efficiency of your network by offloading internal traffic-handling tasks from your router and allowing it to manage primarily external traffic and security. Additionally, Cisco 550X models provide dynamic Layer 3 routing features. With these capabilities, you can minimize the need to manually configure routing devices and simplify the ongoing operation of the network. IPv6 support As the IP address scheme evolves to accommodate a growing number of network devices, the Cisco 550X series can support the transition to the next generation of networking and operating systems such as Windows 7, Vista, and Linux. These switches continue to support previous-generation IPv4, allowing you to evolve to the new IPv6 standard at your own pace and helping ensure that your current network will continue to support your business applications in the future. Cisco 550X series switches have successfully completed rigorous IPv6 testing and have received the USGv6 and IPv6 Gold certification.